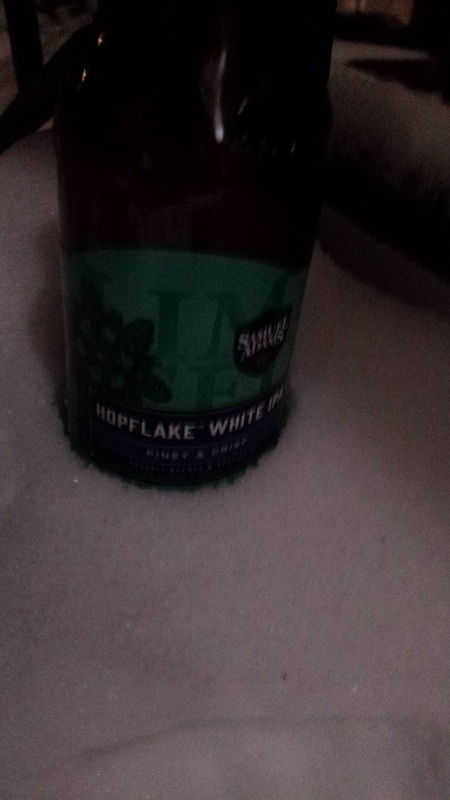 This week's Sunday Night Suds looks at Samuel Adams Hopflake White IPA. The Hopflake White IPA is included in this year's winter mix box which also includes another new beer (Samuel Adams Ginger Beer); Boston Lager; Winter Lager; the old time favorite Old Fezziwig and the Chocolate Bock (which is DAIRY again this year). The beer poured a golden yellow, but a little pale for an IPA. In fact, although they call this an IPA, the Hopflake White IPA is not heavily citrusy and is somewhat watered down. Having said that, there is some pine and some lemon which may or may not be from the lemongrass. This beer is very drinkable, but not a classic IPA and even a bit light for a winter beer. I would recommend pairing this with pizza or other spicy, saucy fare. If you have had a combination which works for you, please post it in the comments below. The Samuel Adams Hopflake White IPA is under the Kosher Supervision of the Star-K and has a Star-K certification mark on the label. To see what the experts on Beer Advocate think about this brew, please follow this link - beeradvocate.com/beer/profile/35/241737.